5. Use the “Site or domain” field to limit your search to a specific internet domain. Example: .edu for educational institutions, .gov for government sites, or enter an entire URL to search within an individual site. Other useful search options include date, language, file type (PDF, Excel, PowerPoint, etc. ), and geographic region. Also see Google Search Help for further details. 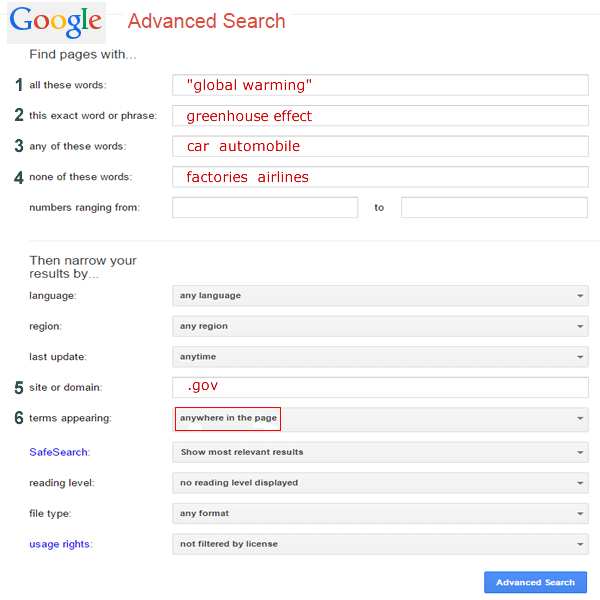 Note: The following example limits search results to government internet sites (domain = .gov) that address global warming/greenhouse effect, and the influence of cars or automobiles, but excluding the influence of factories or airlines.